What's the difference between Kwiziq and Progress with Lawless Spanish? How does Kwiziq help me learn? Can I save or bookmark lessons? Can I choose specific lessons to study? How can I type accents? Is Kwiziq available for any other languages? What kind of Spanish will I learn? How does Kwiziq scoring work? I get high scores on tests, so why is my Kwiziq score so low? I got 10/10 on a kwiz, why did my level score go down? When will I go up a level? How can I read my Progress Report? Can I retake the CEFR level test? Can Kwiziq help me prepare for the DELE, SIELE, CELU or the AP Spanish exam? Do I have to be a teacher to moderate a Studygroup? What are the benefits to upgrading? How do Premium subscriptions work? Why have my grammar emails from KwizBot stopped? How can I log in with Facebook or Google? How do I change / cancel my Premium package? Kwiziq is a powerful A.I. software "Language Coach" that intelligently helps you improve your Spanish by finding out exactly what you know, don't know and have mis-learned (or mistakenly assumed to be true). It challenges you with personalized kwizzes that build up a picture of your confidence across the language. As you work your way through the system, KwizBot suggests a variety of content via your personalized Studylist to make sure that you're always working on exactly what you need the most help with. Both sites are powered by Kwiziq and in that sense they are (almost) the same. You can use any Kwiziq-powered site (we have a growing number) and it will always be your Kwiziq account underneath storing your progress. Laura's main site, www.lawlessspanish.com (note "www" instead of "progress"), has a number of additional resources that are also linked to Kwiziq. It will keep track of your progress (wherever you see kwizzes on those pages), so in short, it doesn't matter which version you use. We understand that people visit many web resources in their attempts to learn a language and so our aim is to provide a common supporting learning platform beneath these for a more connected and intelligent learning experience. Kwiziq breaks the Spanish language down into its smallest components, a bit like language "atoms": vocabulary and grammatical rules. Our database has thousands of questions specially designed to determine how well you know all of these things, and by kwizzing you on them, it can find out what you know - just as a human tutor would simply by talking to you. Kwiziq first builds up a rough picture of your approximate level, and then starts to get into the details, kwizzing you in relevant areas to help you practise recall, mobilise what you know and reinforce your memory. It will help you identify your own mistakes so that you don't accidentally practise writing and saying the wrong things, and it'll show you examples with video and audio of the correct forms so you can see and hear them. Kwiziq is like your very own personal tutor, available all the time. And it's even better if you already have a human teacher or tutor because it can help them teach you Spanish even faster - see Features for Teachers. KwizBot will work out exactly what you need to practise next (and organize it nicely into a Studyplan on your Dashboard), and will help you perfect your Spanish. It will also enhance your recall with detailed lessons and questions, teaching by example with audio and video. Kwiziq keeps a list of the 10 most relevant lessons for you to read in your Studyplan, and updates it every time you take a kwiz. You can see a list of all of these lessons by area and level in the Library (found in the top menu on your Dashboard). If Kwiziq discovers you're an intermediate or advanced student, it will help you to go back and fill any gaps in previous levels. So don't worry if you didn't quite learn all the verb conjugations in El Pretérito Imperfecto or El Pretérito Indefinido before you moved on to El Futuro and El Subjuntivo, Kwiziq will ensure you master everything. Absolutely! Here's how to save lessons to and use the Notebook. Sure! Just use the search box in the upper-right corner of any page or visit our grammar index. You can then add the lesson to your Notebook along with any other lessons you want to study again. With a Premium account, you can have multiple Notebooks and create unique study plans based on whatever themes you like! 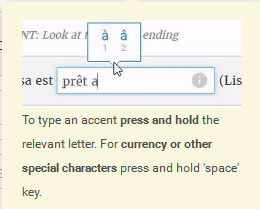 Desktop and laptop users can easily type accents with our custom-built accent picker: just press and hold the letter that you want to add an accent to, or the spacebar to type currency or other symbols. For accents on capital letters, you'll need to enable caps lock, then press and hold the desired letter to see the list of accents. The accent picker won't appear on mobile devices since they usually have this functionality built in: just long press a key to see a list of accents and special characters. Slide your finger to the desired character and then release to insert it. If no menu pops up, you can install a free keyboard app like SwiftKey. KwizBot is the friendly face of Kwiziq's A.I. Whenever you practise your Spanish on any Kwiziq-powered website, he works on building up a picture of your Spanish in his artificial brain. He then recommends lessons for you to study and works out what you need to practise, and he'll even send you reminder emails with selected examples in Spanish based on what he knows about your Spanish knowledge. He's pretty smart, and he's getting smarter all the time. Find out more about him in our exclusive interview: Meet KwizBot. One- and two-year certificates that you can purchase for your favorite Spanish lover - learn more. Yes! We currently have French and Spanish, and you can also vote for the next language we should work on. Progress with Lawless Spanish currently focuses on Peninsular Spanish. We test on the vosotros form and we encourage students to learn this form because its always useful to know more. However, in the future we plan to widen our scope so that you can select which type of Spanish you learn. For the moment though, there is no way we can "turn off" vosotros. Please do keep a list of any other annoyances or differences that you would like us to cater for as we can then design future updates around these needs. We can also update lessons with special notes on variations too, wherever you find these are needed - you can simply comment in the Q&A section under a lesson with a suggestion. We'll do our best to work around the issues as much as possible until we're in a position to handle them better. Your Kwiziq score is a measure of how confident the system is that you know something. We use a special algorithm to estimate confidence with scores ranging from -100% to 100%. See the full explanation of how the Kwiziq Scoring system works. Kwiziq scores are not the same as test scores. You should consider a Kwiziq score above 75% very good (this is hard to achieve), but remember that our system is not an exam that you pass: Kwiziq is designed to help you increase your confidence in the language. You may need to answer questions correctly many times to prove to KwizBot that you know your onions! We are always adding new lessons and questions to the system. Your scores are calculated "out of" the whole level, so when it gets larger your overall score reduces. Since historic scores were calculated in the past, they will stay higher. Once you've earned a silver shield (75%) at your current level. 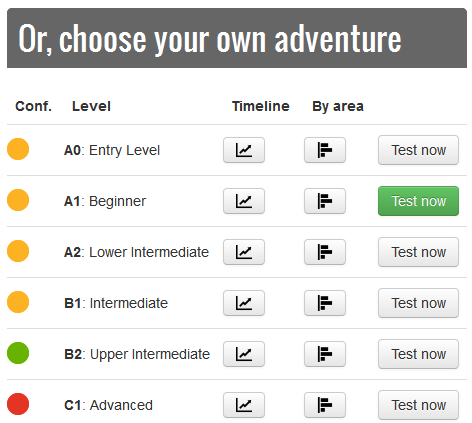 If you can't wait, you can test in the "Choose your adventure" section and your Studyplan will update accordingly. A fun way to track your progress and stay motivated - learn more. Interactive maps of your grammar knowledge - learn more. Level indicates the CEFR level, which is tied to the official Spanish proficiency tests DELE. Kwiziq Score is our unique grading system, which requires a score of at least 75% to pass each level. Any negative score is due to incorrect answers. You lose points for wrong answers, whereas if you skip the question, you just get a null score. So it's always better to skip questions that you're not sure about, rather than guessing. Note that it is possible to pass, say, B2 but not A1 - this means that you have some knowledge gaps in the latter and/or you haven't yet proven your familiarity with those topics to our A.I. KwizBot. You can rectify this by going to your Dashboard and taking that level test under Choose your own adventure. The green dot indicates that this user has achieved reasonable confidence (a Kwiziq Score of at least 50%) at level B2, while the Progress Report tells us that he or she hasn't yet reached the 75% pass threshold. The red dot shows poor understanding of C1 topics, while the yellow dots indicate that more testing needs to be done at those levels. Topic Coverage refers to the percentage of our topics you've been kwizzed on within each level - though you may have only answered some of the questions within that topic. You should aim for 100% coverage in each level. Question Coverage is the percentage of questions within the level that you've answered correctly. It takes longer to achieve 100% question coverage than 100% topic coverage, naturally. This figure will go beyond 100% when you answer questions more than once over time across multiple rounds of practice. So this user has touched on every B2-level topic, but has only answered two-thirds of B2 questions. Some of our super kwizzers are on 800% question coverage (i.e., eight rounds through the whole system of questions which can lead to excellent Progress with Lawless Spanish scores). CEFR, the Common European Framework of Reference for Languages, is a standard way of describing language proficiency - learn more. The short answer is no. We are working on ways to reassess your level, but retaking our CEFR entrance level test is not a good idea because the test questions are fixed. It's a specially designed set of questions that aims to test your level with as few questions as possible. There are only between 8 and 18 questions asked per level and as such it can only ever be a rough indicator of your linguistic skill. We will eventually offer more thorough level re-assessments, but in the meantime, we encourage you to take the level tests on your Dashboard. Every time you click a level test, KwizBot will design a short (usually 10-question) test for you to help you improve your skills at that level. By taking as many of these as you can, you will rapidly perfect your skills at the chosen level. In addition to audio found throughout lessons and kwiz results pages, many of our blog articles include sound files. Also see our recommended podcasts and listening resources. Yes! Regular testing is an excellent way to find gaps in your knowledge and improve your Spanish in preparation for any test, so just head over to your Dashboard and get kwizzing! Studygroups help you organise and teach groups of students with full Kwiziq A.I. support - learn more. You can create a Studygroup with friends, family, conversation clubs - any group of people you want to study and grow with. We offer a free package with 10 kwizzes per month. This is ideal for casual learners and will always be totally free. If you want to get more serious about your studies, you can upgrade to a Premium subscription. Just wait until next month - learn more. See Premium features or our upgrade page for more info. The total amount on the pricing page is paid in one lump sum for the package term; Amount / Month shows you how the price works out to per month, decreasing dramatically as you subscribe to longer terms. Progress with Lawless Spanish Premium is a subscription, meaning that if you subscribe for one, three, or 12 months, your subscription will automatically renew at the end of that period. (Biennial packages are one-off purchases.) You can disable automatic renewal in your account at any time: Change your package. This will not affect your current subscription; it will simply prevent it from renewing when it expires at the end of the term. If you test at least once every day, then he doesn't send you emails because he knows that you are looking at your grammar lessons online and have the concepts fresh in your mind. If you go 24 hours without testing, he will send you your first reminder lesson selected from your recommended studylist. He will do this daily for a week to remind you of the different lessons in your list. If you don't test for more than a week, he will slow the frequency to once per week, assuming that you don't have time for more study. If you don't test for more than a month, he'll slow again to once per month. The frequency resets whenever you test again since he knows you're back to working on your language skills. You just need to connect your accounts. You can change your email address by going into your account details page (log in and click your name at the top right). If you can't do this for some reason, you can email us from the original email that you registered with (we have to be sure it's the same person requesting) and we'll be happy to update it for you. Please use the password reset function. Just make sure that your new password has at least 8 characters, including at least one UPPERCASE letter. You can change the length of your Premium package or cancel auto-renewal in your account. If you want to delete your account completely, including all of your progress, please email us. If you have a question about Spanish or think you might have found an error in a lesson or kwiz, please post your question / comment in the QandA forum. If possible, please use the "discussion" link under the relevant lesson so that other users can benefit from the information. If you have trouble logging in or any other technical difficulties, please use our contact form and we will respond as soon as possible. If you have a support query you may be asked to send us a screenshot to help us identify the problem. Below is a list of help guides (provided by third parties) to explain the process, depending on your operating system. After you save the image to your computer, please reply to the support request using your email client as usual and attach the saved screenshot just as you would any other file. Please make sure the url (web address) is visible on the screen shot or included in the response.